Thaci’s election is invalid because it breaches the rules established by the constitutional court in its judgement annulling the election of Pacolli, in 2011. That decision was wrong, and often absurd (see this essay). But according to article 116.1 of Kosovo’s constitution ‘Decisions of the Constitutional Court are binding on the judiciary and all persons and institutions of the Republic of Kosovo’: right or wrong, the court’s decisions must be obeyed. I already wrote about the first rule: the court established that when parliament convenes to elect the president all MPs must be present, except only those whose absence is excused. When Thaci was elected 39 MPs were absent, and had not all been (plausibly) excused or suspended. So the election is invalid: it’s as simple as that. But let’s set this problem aside: let’s assume that the speaker of parliament did properly excuse or suspend all absent MPs, and turn to the second reason why Thaci’s election is not valid. The question concerns the competitiveness of the presidential election. The court annulled Pacolli’s, who had run unopposed, also because the constitution requires at least two candidates to be running. The reasoning is based on the text of the constitution (article 86), which speaks of ‘candidates’, in the plural tense, and above all on its purpose, because – the court says, in a brief moment of lucidity – having more than one candidate is ‘more democratic’ (paragraph 71 of the judgement: see the English version). Now, this time were two candidates: Thaci and Rafet Rama, a PDK MP. But Rama’s candidature was not authentic: it was a purely formal candidature. I shall first prove this point, and then explain why it invalidates the election. The evidence that Rama’s was a purely formal candidature is plentiful and obvious. First, Rama is a member of Thaci’s own party, which since 2011 wanted Thaci to be the next president: so, there was no serious political support behind Rama’s candidature. Second, his candidature emerged only two days before the election, when the vote was scheduled: so, there was no real preparation behind this candidature. Third, Rama’s candidature was not announced by him but by the speaker of parliament, and Rama did nothing to advertise it, persuade MPs to support it, or campaign for it: so, there evidently was no real conviction behind his candidature. As if to prove all this, the result of the third ballot, the only one that counted, was as follows: 81 MPs present and voting, 10 invalid votes, and 71 for Thaci. Rama received no votes. He was present and voted, but did not vote for himself. He even reportedly said that he voted for Thaci in each of the three ballots. Plainly, Rama’s candidature was viewed – first of all by the candidate himself – as a formality, tedious but necessary. Of course, the government and its supporters and propagandists will retort that Rama’s candidature was indeed an authentic one, and not just a formality. But they will, as usual, sound as ridiculous as those who say that Kosovo is still the southern province of Serbia: accepting Rama’s candidature as an authentic one is like inferring from the results in North Korea that 99% of the population supports its ruler. Everyone knows that this candidature was a mere formality, organised by PDK for the sole purpose of respecting the two-candidate rule. But they made a mistake, because they read the rule in a purely literalist sense. It is obvious, in fact, that a merely formal candidature is not sufficient to make the election ‘democratic’, as the constitution requires. Democracy is debate and competition between different proposals and ideas, in fact, and last week nobody discussed, weighed, or even considered Rama’s candidature: running against a non-authentic candidate, who neither campaigns nor votes for himself, is no different from running unopposed. As Rama’s candidature did not make the election ‘democratic’, it directly follows that Thaci’s election was unconstitutional. Again, it’s as simple as that. This problem was entirely avoidable, incidentally. PDK should have told Rama to announce his candidature a little earlier, organise a few rallies, and vote for himself (at least! ): then, even though Rama had no real intention to become president, it would have been hard to prove that his candidature was not authentic. PDK didn’t do this because they are incompetent, and they are incompetent because they have no incentive be competent, as they rule by brute power (which, incidentally, is also why they can afford to say ridiculous things without fearing ridicule too much, because their media will advertise what they say as the purest distillation of human wisdom). So, Thaci’s election is exactly as invalid as Pacolli’s was, and can be challenged before the constitutional court. Should this happen, the judges and their political masters would have to decide between annulling the election and taking back the 2011 judgement (which would blow up whatever credibility the court may still have). Either way, progress towards a more open and accountable political system would be made, for Kosovo can find better presidents than Thaci, and from the ashes of this court a better one might rise. Let me switch to a different register, and address myself to the diplomats of Pristina. You will agree, I presume, that annulling this election will make protesters a little more trusting of the institutions. You will also agree that this would make it easier to overcome the current political crisis, which Thaci’s election can only have deepened. In 2011 it was probably wise to sacrifice Pacolli to public sentiment: it would be wiser to sacrifice Thaci now. The dialogue with Serbia is no obstacle, dear diplomats, for you can easily find someone else to do that. Indeed, almost any other prominent figure would be better than Thaci at doing that: just look at where his stewardship of the domestic side of the dialogue has led you. A more participated dialogue, moreover, led by a more credible figure, is likely to produce better and more sustainable results, to everyone’s benefit. All you need to do is send word to the three foreign judges of the constitutional court, and to the three or four non-PDK ones: it will take half an hour to line up five votes in favour of a judgement annulling Thaci’s election. Since June 1999, or March 2004, Kosovo has never been closer to serious unrest. 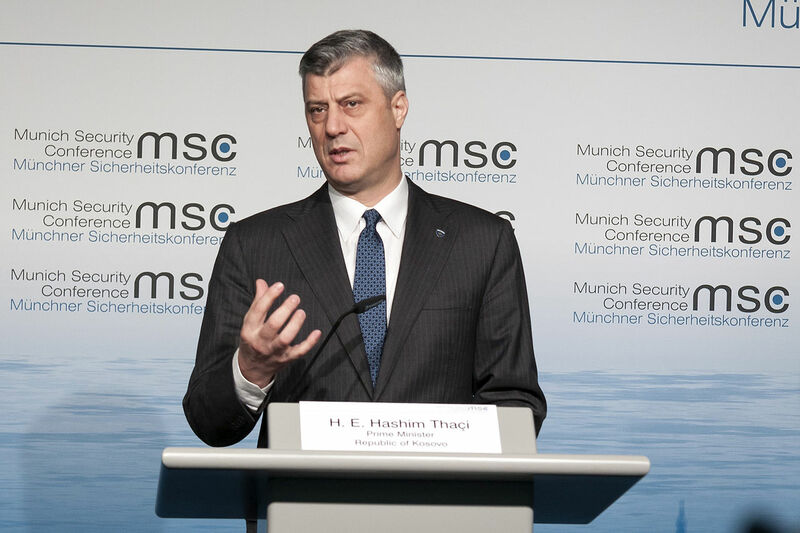 Nothing is inevitable, of course, and I hope that nothing bad will happen: but if you don’t sacrifice Thaci now you might soon realise that you have let the last real chance to solve this crisis slip through your fingers.